Not to be confused with Bora Bora or Tora Tora. Tora Bora (Pashto: توره بوړه‎, "Black Cave") is a cave complex, part of the Spīn Ghar mountain range of eastern Afghanistan. It is situated in the Pachir Aw Agam District of Nangarhar, approximately 50 km (31 mi) west of the Khyber Pass and 10 km (6.2 mi) north of the border of the Federally Administered Tribal Areas in Pakistan. Tora Bora was known to be a stronghold location of the Taliban, used by military forces against the Soviet Union during the 1980s. Tora Bora and the surrounding Spīn Ghar range had natural caverns formed by streams eating into the limestone, that had later been expanded into a CIA-financed complex built for the Mujahedeen. The lithological nature of Tora Bora is predominantly metamorphic gneiss and schist. During the U.S. invasion of Afghanistan the cave complex was one of the strongholds of the Taliban and Al-Qaeda, according to Donald Rumsfeld. It was the location of the December 2001 Battle of Tora Bora, and suspected hideout of Al-Qaeda leader Osama bin Laden. It was reported that in 2007, U.S. intelligence suspected Osama bin Laden planned to meet with top Al Qaeda and Taliban commanders at Tora Bora prior to the launch of a possible attack on Europe or the United States of America. Tora Bora was variously described by the western media to be an "impregnable cave fortress" housing 2,000 men complete with a hospital, a hydroelectric power plant, offices, a hotel, arms and ammunition stores, roads large enough to drive a tank into, and sophisticated tunnel, and ventilation systems. This fortress at Tora Bora had been developed as a CIA-financed complex built for the Mujahideen. Aerial view, 3D computer generated image. Tora Bora is in the upper-right quadrant. An elaborate military operation was planned which included deployment of the CIA-US Special Operations Forces team with laser markers to guide non-stop heavy air strikes during 72 hours. 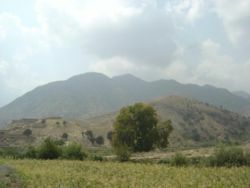 When Tora Bora was eventually captured by the U.S. and Afghan troops, no traces of the supposed "fortress" were found despite painstaking searches in the surrounding areas. 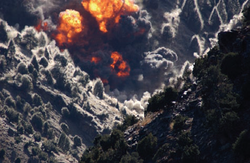 Tora Bora turned out to be a system of small natural caves housing, at most, 200 fighters. While arms and ammunition stores were found, there were no traces of the advanced facilities claimed to exist. The complex later was retaken by the Taliban, and served as an important base for the Taliban insurgency. In 2017, Tora Bora was attacked and captured by the Islamic State of Iraq and the Levant – Khorasan Province (ISIL-K), though the Afghan National Army soon recaptured it. ^ Robert Lee Hadden (2005). Adits, Caves, Karizi-Qanats, and Tunnels in Afghanistan: An Annotated Bibliography. ^ Eric Schmitt & Thom Shanker (May 5, 2011), Long Pursuit of Bin Laden, the ’07 Raid, and Frustration, The New York Times, retrieved September 8, 2011 . ^ Steve Rose, hunt for bin Laden - Tora Bora, guardian.co.uk, retrieved September 8, 2011 . 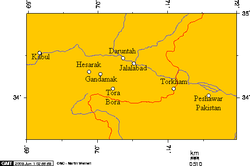 ^ Tora Bora: Al-Qaida's last stronghold, The Guardian, 20 December 2006. ^ "Floorplan of Bin Laden's mountain fortress". truthseekers.cultureunplugged.com. Retrieved 13 August 2018. ^ Adam Curtis (Director) (October 20 – November 3, 2004). The Power of Nightmares: The Rise of the Politics of Fear (TV documentary). BBC Two. Retrieved September 8, 2011. ^ Steve Rose (May 4, 2011). "did Osama bin Laden build such a drab HQ?". Guardian. ^ a b Edward Jay Epstein (December 11, 2001), Lair of bin Laden, retrieved September 8, 2011 . ^ Matthew Forney (December 11, 2001). "The Tora Bora Caves". Time. .
^ Ludovica Iaccino (15 June 1017). "Isis unable to stay in Osama Bin Laden's Tora Bora fortress for long". International Business Times. Retrieved 20 June 2017. ^ Nordland, Rod; Abed, Fahim (14 June 2017). "ISIS Captures Tora Bora, Once Bin Laden's Afghan Fortress". The New York Times. Retrieved 16 June 2017. ^ Associated Press (17 June 1017). "Afghan Official: Afghan Security Forces Recaptured Tora Bora". The New York Times. Retrieved 20 June 2017. ^ "Afghan Official: Afghan security forces recaptured Tora Bora". Fox News. 17 June 2017.